If you already a certified diver but have not dived for a while then this program gives you a great opportunity to refresh your diving knowledge and skills. This course is recommended for anyone who hasn't dived for a period of six months or longer. With a few simple steps you can refresh your dive knowledge plus get to see the wonderful marine life Phuket has to offer and find yourself surrounded by fishes in nature's aquarium. One Start the program by taking a short quiz and discussing the results with your instructor. Two Watch your instructor demonstrate how to set up the equipment whilst reminding you of the different parts of your scuba gear and how to use them. Three Enter the sea. At the beginning of the dive your instructor will demonstrate the most important skills needed for diving and then get you to repeat them. Four Explore the local reefs with your instructor and have your breath taken away by the amazing beauty of the underwater world! Safety: This should be the first priority of every diver when diving anywhere, especially in a new place. With over 30 years between us of diving in Phuket we have an excellent safety record. This is due to our vast experience of diving in general but also because of our local knowledge. Our focus is on preventing problems from occurring rather than having to solve them. Quality: We started our own diving company in Phuket because we felt unable to offer the quality we wanted when working for the bigger companies. Rather than being about profits we wanted to be about personal service. This is why we became the first dive company to offer diving courses in Phuket with only private instruction. We continue to do this and to stay small rather than give up our principles and make more money. Fun: You don't dive because you have to, you dive to have fun. Us too! There is no place on this planet that we prefer to be than underwater. We never get bored of being surrounded by fishes. 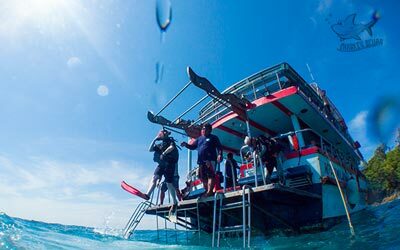 If we can help you to have as much fun diving as we do then it will probably be the best experience of your time in Phuket! To enable us to give you the safest and best diving experience, we only offer private tuition for all our diving courses in Phuket. Read about how this benefits you here. Online booking discounts of between 5% and 20% are available on all course prices depending on the number of students. Terms and conditions apply. Certified divers and snorkellers are welcome to join on the trips too. Certified divers can receive a 10% discount off the standard trip price if diving with the student(s). Full trip price list here. Note: Due to weather conditions, the Silver package is only available between end of October and end of April. *Complimentary transfers are only included for boat trips. Free transfers to/from hotels are from the following towns: Chalong, Kamala, Kata, Karon, Patong, Rawai*.Transfers are also available from other areas around Phuket for a small surcharge. Prices available on request. A cute, little reef with a variety of hard corals and lots of colourful fishes. Generally clear water, wonderful marine life with dives in sheltered bays. A great mix of landscapes/marine life where larger wildlife can be spotted including turtles. Times given below are for Morning/Afternoon program. All times are approximates. Self-Study Watch the "Introduction to Diving" video online. 09:00/13:00 Meet at Sharkey Scuba office in Karon, complete program paperwork and take a small quiz. 09:15/13:15 Discuss the quiz, try on dive gear and practice setting up your equipment. 10:15/14:15 Transfer to Kata beach, put on equipment and enter water. 10:45/14:45 Practice skills including buoyancy control and go for the dive. 11:45/15:45 Exit water, take off gear and return to Sharkey office. 12:15/16:15 Look at Fish I.D. slates, identify what you saw and log dives. Exact hotel transfer times depend on where you are staying. All times are approximates. 07:00-08:00 Transfer from hotel to Chalong pier. 08:30 Depart Chalong pier/breakfast/complete program paperwork and take a small quiz. 09:00 Discuss the quiz, try on dive gear and practice setting up your equipment. 10:00 Put on equipment, enter water, practice skills including buoyancy control and go for the dive. 11:15 Freshly cooked buffet lunch on board. 12:45 Go for second dive and continue skills practice in between exploring. 14:00 Depart for Chalong pier. Look at Fish I.D. slates, identify what you saw and log dives. 15:15 Arrive at Chalong pier and transfer back to hotel. 10:45 Put on equipment, enter water, practice skills including buoyancy control and go for the dive. 11:45 Freshly cooked buffet lunch on board. 13:00 Go for second dive and continue skills practice in between exploring. 15:15 Go for third dive. More skills practice if needed or wanted on the dive. 16:15 Depart for Chalong pier. Look at Fish I.D. slates, identify what you saw and log dives. 17:30 Arrive at Chalong pier and transfer back to hotel.